I was an afficianado, even a dabbler before my trip to the tea shop with dolceleontina but now I’m a junkie. And I’m not talking Celestial Seasonings or generic Lipton crap (though I still think Red Rose makes the best plain black iced tea). 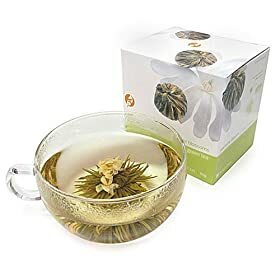 I’m talking jasmine flowers hand-picked by naked virgins and tied with food-grade, organic cotton string so that they display nicely when gently bathed in your tea cup. Ok, maybe I made up the part about the virgins. You are currently browsing entries tagged with tea at More Than Just the Food.